Most forecast systems had their birth in manufacturing due to the number of potential customers. Manufacturing and sales forecasting fit together nicely. The issue in the world of retail and wholesale is lost sales. There is no such thing as a lost sale in manufacturing. Also think about promotions and events, manufacturing cannot just jump production 30% for the week and then drop it. 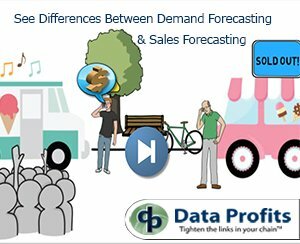 Most forecasting software packages don’t have the ability to forecast demand because they do not have the math methods to support demand. Also, demand does include lost sales and promotional sales. Sure, they may have a report and you may go MANUALLY edit a forecast from some exception due to an event. The reality is most forecasting systems use sales forecast methods. Why, because the software was written for a different customer base years ago. Couple that knowledge with the fact that most of manufacturing does not deal with slow and intermittent demand. Manufacturing makes a product run, stops, swap and make a different product run. Retail and Wholesale must maintain inventory of slow and intermittent selling products. There are some very accurate slow and intermittent demand forecast algorithms, IF the forecast packages use these algorithms. The reality is slow and intermittent forecast algorithms are very math intensive. The computer program needs expensive hardware to run fast enough and that is costly when the product/ location count exceeds 100,000 product locations. Most forecasting software uses time series forecast with additional methods applied to the Time Series algorithm. Some forecast packages have as many as 100 methods they use inside their time series forecast algorithm. Ask yourself how well does that work for slow demand and seasonal products? Seeing a result is often much easier than reading a blog. 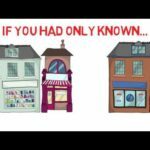 We created a short video of two retailers to highlight the results in real world terms for demand vs sales forecasting. 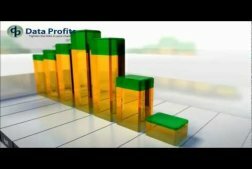 The Data Profits video follows two food retailers but highlights the same issues I saw when I oversaw the inventory for a 300+ store soft-lines retailer and a 50 store hard-lines retailer. This video has the key terms and events in your operations. The video shares ideas to aid you in improving your forecasting for inventory. The results for the two retailers model what we have seen in the marketplace for the past 15 years. With the dawn of ‘everything internet’ and digital marketing the problems caused from sales forecasting methods are having a faster negative impact of business. The digital marketing world has cut down retail/ wholesale response times and that has killed several retailers in the past two years. Watch the video and sign up for our blog. We have several new videos we will release in the next 6 months to help you grow your profits. 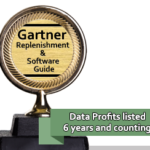 Data Profits is here and ready to help. Contact us for a free consultation about your forecast accuracy and inventory management opportunities. You can also request a demo and see how things can really start to improve in your business in 90 days.